Alright, a rather catchy headline but let’s take a deeper look. For any developer, it is common sense that, APIs have developed to be the most important means of interconnecting services both internally and externally of companies. APIs have been doing exactly that for quite some time. Looking at travel: Long before retail or even software vendors were using APIs as a way to distribute their products online, airlines were using APIs for so much more! Airlines were using APIs to make sure that flight seat availability was pushed to local travel agencies or other airlines and passenger data was transported correctly to ensure customers arrived at their intended destination. Most of those initiatives rely on the interoperability of services without heavy middlemen and therefore also rely on APIs. Lufthansa Group, as a tech-savvy airline, wants to be on one of the top frontrunners of the above-mentioned changes and has created various ways to interact with the group. One of those ways is the Lufthansa OpenAPI where, together with the Lufthansa Innovation Hub, we provide an easily-consumable, but limited in functions, free Open API. To consume the API, you just have to register with our friends at RapidAPI or directly on the developer portal. Immediately afterward, you are able to access a big, non-Lufthansa Group-specific, DB of reference data. This data includes information about airlines, airports, planes as well as live information of Lufthansa Group flight status, schedule, and the seat maps of our flights! So have fun using our data here at RapidAPI and do hold back with feedback or criticism as we are also learning with each one of you! Lufthansa Group is happy to kickstart a NDC Partner Programme for agencies, travel tech provider and corporate accounts. The program offers NDC compliant API based booking and also comes with further incentives. Within the OpenAPI we are, by intention, not NDC compliant when distributing fare and availability data. The reason for this decision is that we want to attract partners from outside the travel tech environment and in our opinion NDC is too heavy for those partners. For more information please visit the website of the Lufthansa NDC Partner Program. BestPrice or no BestPrice, that is the question! New fare calls are available to you: "BestPrice Lowest Fares" and "BestPrice Best Fares" to complement the already existing "Lowest Fares" and "Best Fares" calls! The obvious question to fit your programming needs: BestPrice or Non-BestPrice calls? The existing calls are Airline Catalog based. In your call, you have to specify an airline code to retrieve the fares of a specific airline. The new BestPrice calls offer information on all airlines on LH.com. No need to include the airline code here! You can review the documentation on the calls here. New data, partnering and kick back model to start 2017! More than 118 Million API calls, which is more than the number of passengers traveling with our group around the globe! Our first public partnership with Flightstats in March! 2017 is going to start with an already announced release of new data from fares, availability and deep linking for Eurowings, Lufthansa and Austrian Airlines. It took us some time but as fares and availabilities are at the core of an airline, things needed further approval rounds! From mid of January 2017 on we will offer a variety of fare calls from all fares for a specific date, lowest fare for a specific date to best fare in a period. 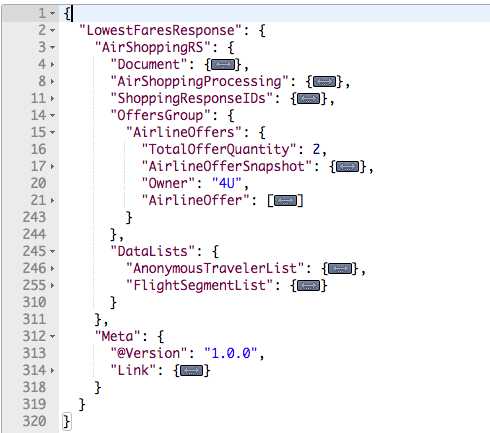 Within the response structure you will find 2 sections, the AirShoppingRS and the Meta part. For those, familiar with IATA’s NDC (New distribution capability the AirShoppingRS part is heavily based on equivalent part within NDC standard. In AirShoppingRS you find some general information about the offer, the offer itself (OffersGroup) and the corresponding traveller/flight segment information (DataLists). Together with fares, we are also introducing a new partner model. To be able to consume our fare data, we do want you to give us some further information about your company and the service you are providing. This means you have to complete the questionaire here. We will then check your information come back to you individually with next steps. Please be ensured, that we will answer all of your registrations asap and are well aware that this model is not a scaleable solution. Evolving from this first humble steps is besides the new data, at the core of our interests! As fares are shared with various providers in different contexts by our group, the open API has its own distribution segment. We are looking for partners with B2C services that are not metasearcher, traveltech provider or companies that own a IATA designator for travel agencies. If you consider yourself as one of above mentioned, I may forward your inquiry to the respective department within our group for further steps. If not, happy to discuss next steps! Furthermore the new partner model, also comes with a compensation that is inline with affiliate marketing compensation modell! Each Lufthansa fare information comes with a personalized deep link that forwards to LH.com for booking of the offer. If the deep link leads to a booking on LH.com we compensate your efforts. The principle is nearly the same as within affiliate marketing where the last cookie resulting in a purchase is rewarded with a kick back. As fares and deep linking are just the start, we are working on expanding the functionalities and are tackling booking integration, ticket servicing and loyalty information. Links for you to register or if you have any questions! 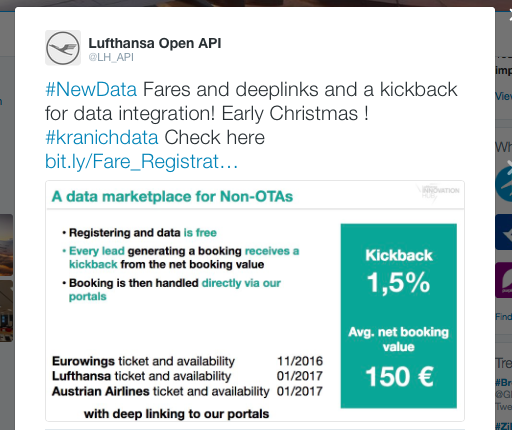 Data offering on the Lufthansa OpenAPI is getting bigger again! Today we successfully released live information about Eurowings flights. Furthemore Lufthansa flights do now have information about availability of WIFI - Flynet - and Inflight Entertainment onboard, integrated. To get the information you just have to use the schedule call from operations and have a look at the Equipment Object. Here is an example of LH400 from JFK to FRA on September 1st. If not - Register here! Follow us here on Twitter for news and updates! Happy to annouce that last week the OpenAPI team and FlightStats team successfully ended integration testing. FlightStats provides data services and applications to the travel industry and traveling public and is now using the flight status information provided by the OpenAPI within its services. Already in the testing phase both partners could see benefits from the accuracy and broad usage of the data. Thanks to both teams and looking forward to further integration projects! Just follow @lh_api for further news. Happy to annouce that our methods "Flight Status" and "Flight Status by Route" do now also offer data for Austrian Airlines and Swiss Airlines! Germanwings / Eurowings data to follow soon. Looking forward to your feedback on other data you love to see on the OpenAPI . Just follow @lh_api for news! Our offer information just got a bit better. You can now retrieve Lounge Information through the API. Find information about airport specific lounges, opening hours and amenities. For a detailed documentation check the API docs. Have fun & let us know what you are missing!